I was incredibly excited when just a few short weeks ago, an email popped into my inbox inviting me to the Wearisma Lounge during London Fashion Week! Having already made plans to journey down and absorb all things street style, I was thrilled to be invited to preview some exclusive collections while enjoying the comfort of refreshments, backstage antics and most importantly, seating. My god were my feet aching, but that’s for another post. 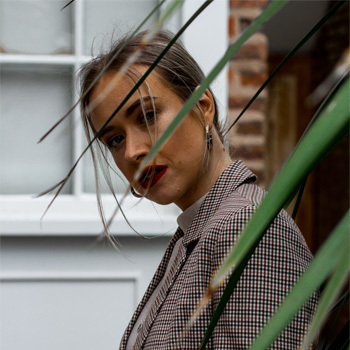 Wearisma are a fantastic company who connect bloggers with brands via Twitter, Facebook and Instagram. I was thrilled to be invited to join their brand new app, giving me the chance to show off to you guys exactly what I’m wearing, and more importantly, where you can buy it, and giving you guys the opportunity to add my outfits to your wishlist ready to purchase! Situated in the fabulous Wahaca just off Brewer Street, The Lounge was an absolute haven amongst the chaos that was Soho during Fashion Week! With sofas all around the room and plenty of tables and seats, it was the perfect place to relax with blogger pals, rest our feet and most importantly, charge our phones! The lovely ladies at Wearisma had also organised for a makeup artist to repair our makeup during the day – perfect for those running between shows. It was great to see collection previews from Illustrate Clothing and A Black & White Story, whose Queen Bee sweater basically needs to take a permanent residence in my wardrobe immediately. I was also lucky enough to be given the chance to collaborate with Illustrate Clothing, so keep your eyes peeled on this little corner of the web to see how I style one of their fantastic print shirts! A huge thank you to Wearisma for putting on such a fantastic event, it was definitely one of the highlights of my weekend and it was so wonderful to meet some lovely new bloggers and absorb the back stage chaos of the shows!